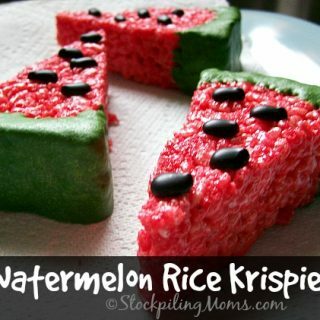 Watermelon Rice Krispies are perfect for a party, BBQ or family gathering! Place in shallow pan, it will start to cool off quickly. Place chocolate chips on top right away so they will melt into the top a little bit. Spray knife with cooking spray or butter and cut rice krispies into wedges and place on wax paper to cool completely. Next dip the ends into melted chocolate and place back on wax paper to cool.